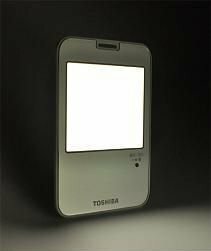 Toshiba developed a new portable OLED lamp - and they will make 100 units of this lamp, and donate these to quake-hit areas (50 units were already donated to the evacuation center in Kesennuma City, Miyagi Prefecture). Toshiba has no plans to sell these to consumers. The lamps run from either four AAA alkaline batteries or from the embedded rechargeable battery - and Toshiba bundle the lamp with a solar-panel (it can also be recharged via a USB port). The lamp measure 146x100x18.5mm (at the thickest part) and weight 180g without the batteries. There are no details about the OLED panel itself, which is made by Toshiba. We only know that lamp brightness is 53 lm (similar to a desk lamp) with 100% brightness, it can be dimmed to 30% or 10%. Using the alkaline batteries, the lamp can be used for two hours on 100% brightness (or 10 hours with 30% brightness and 20 hours with 10% brightness). The rechargeable batteries offer 3 to 4 times more battery life. This is the first time we see an OLED lighting panel from Toshiba. We knew that TMDisplay is developing OLED lighting equipment, but we did not know that Toshiba is developing OLED lighting panels.